Let’s all take a moment to bow down before the King of pies – the great American pumpkin pie. This is without doubt the Best Pumpkin Pie Recipe people. Everyone knows and loves traditional pumpkin pie, but this American favorite has been elevated to great heights thanks to one of America’s best chefs. 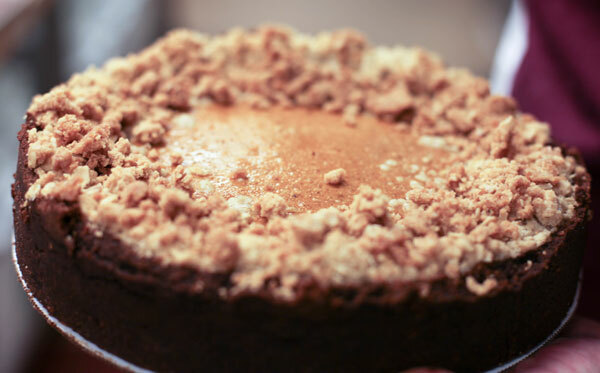 For Made in America: Our Best Chefs Reinvent Comfort Food my friend and pastry expert Richard Ruskell, – he’s the winner of Food Network’s Last Cake Standing– gave me the pumpkin pie recipe to top all others. No seriously, I know I’m just a little biased, but this really is a show stopping pie. 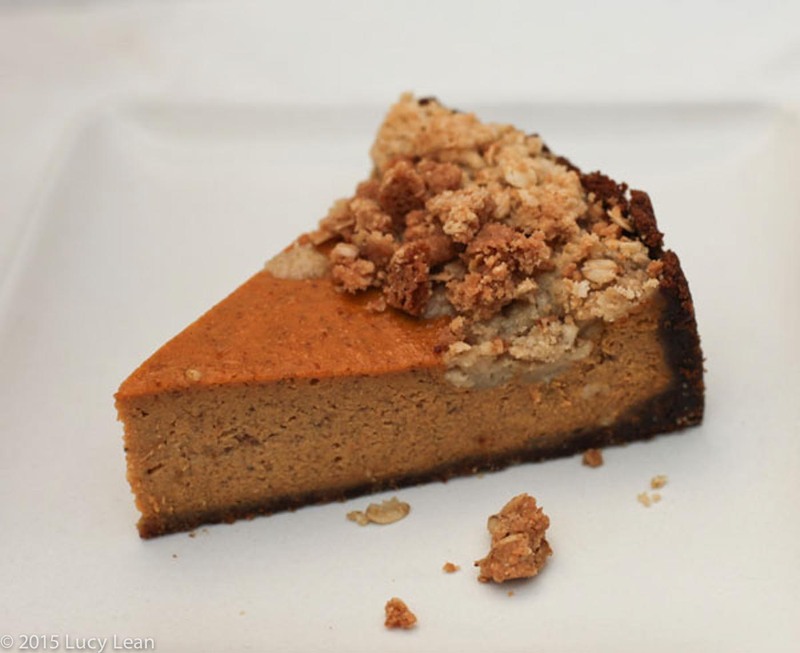 His beautiful pie has a dark gingersnap crust, golden streusel topping and a rich, creamy pumpkin filling. As an added bonus, you also get a killer recipe for molasses spice cookies to use for the crust, or to eat on their own. I first met Ruskell when we judged the Beverly Hills Farmers’ Market annual pie contest together. I was relieved to be sitting beside such an expert of crust and pie filling, as slice after slice was set in front of us to taste. I seem to remember a lot of huckleberries, a nod to the market perhaps, followed by a sugar coma. As the eager eyes of contestants zeroed in on our every gesture, we tasted, poker-faced, then recorded our scores. As one pie arrived, Ruskell whispered to me, “Store-bought crust—too perfect.” I was shocked to find that he was right, and neither of us had to try more than one bite; it certainly wasn’t going to win. Sadly, my desire for pie has been forever diminished by this overload. Ruskell’s, however, seems stronger than ever. “I want to make a pie,” he says, when I ask him what recipe he’d like to contribute to Made in America. The Best Pumpkin Pie recipe for the book of American comfort food. 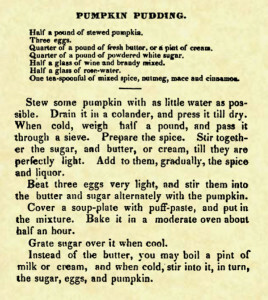 In old American cookbooks, custard-based pies, including pumpkin pies, are called puddings. 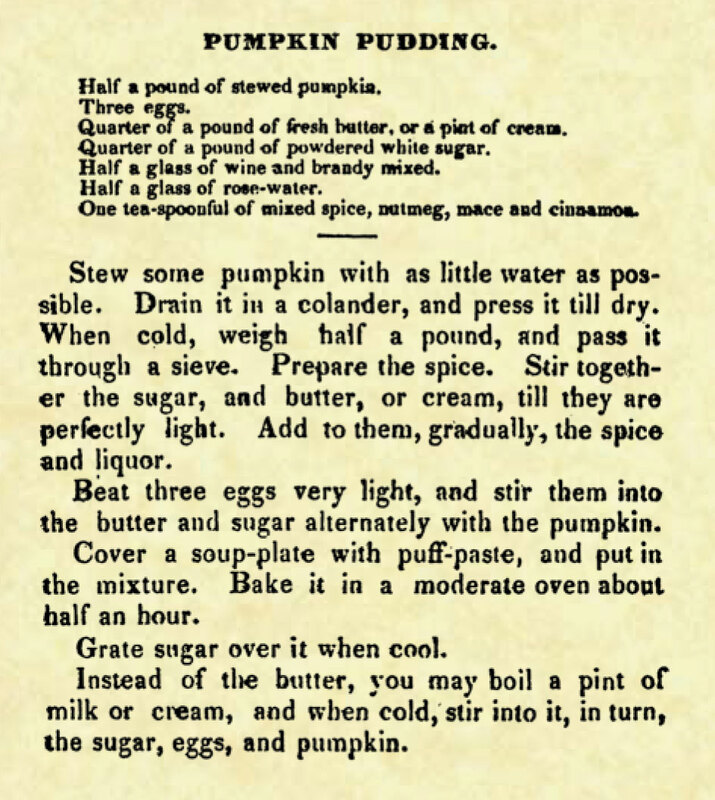 Amelia Simmons, in American Cookery, 1798 (the first cookbook of American authorship to be printed in the United States) has a recipe for “Pompkin Pudding”—a traditional American Pumpkin Pie and close to what we’d expect today from a pumpkin pie. In her book Seventy-Five Receipts for Pastry, Cakes and Sweetmeats(1827), Eliza Leslie shares recipes, or “receipts” as they were called then, that are “drawn up in a style so plain and minute, as to be perfectly intelligible to servants, and persons of the most moderate capacity.” She goes on to bemoan the fact that European recipes often fail due to their complicated nature and lack of “explicitness” in quantities of ingredients. She states: “The receipts in this little book are in every sense of the word American…prepared precisely according to these directions will not fail to be excellent.” Her recipe calls for half a pound of stewed pumpkin, three eggs, a quarter pint of fresh butter or cream, a quarter of a pound of powdered white sugar, half a glass of wine or brandy, half a glass of rosewater, and a teaspoon of mixed spices—nutmeg, mace, and cin- namon. This early ancestor of the pumpkin pie has all the components that we put in our pies today, apart from the rosewater, (which was used a lot in early American cooking and today is rarely found out side of middle eastern candies). 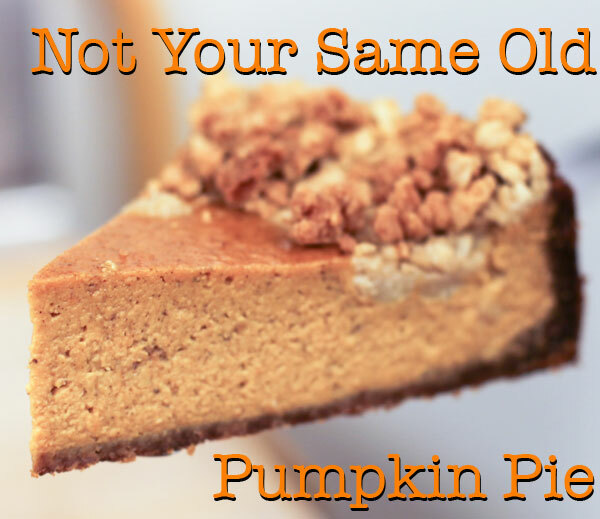 One bite of Ruskell’s pie from Made in America: Our Best Chefs Reinvent Comfort Food and I think you will agree – it’s not your same old pumpkin pie it’s the best pumpkin pie recipe EVER. Period. Richard Ruskell transforms a traditional pumpkin pie, into a modern creation with just a few additions. His pie is not overly sweet, the texture of the filling is light, and the molasses spice cookies in the crust gives it that extra zip. 2. To make the cookies for the crumbs, stir together 2 1/4 cups flour, the ginger, baking soda, cinnamon, cloves, and 1/4 teaspoon salt. set aside. 3. In the bowl of a stand mixer fitted with the paddle attachment cream 1 1/2 sticks of the softened butter and the light brown sugar until light and fluffy. Beat in the egg, then stir in 1 tablespoon of water and the molasses. 4. Gradually add the reserved dry ingredients to the molasses mixture. 5. shape the dough into round balls; then roll them in the granulated sugar. Place the balls 2 inches apart on a parchment paper-lined sheet pan, and flatten slightly. 6. Bake for 8 to 10 minutes in the oven. (For gingersnap cookies, take from the oven and allow the cookies to cool on the sheet pan for 5 minutes before removing. store in an airtight container.) to use the cookies for the crust, turn the temperature down to 300°F and bake for an additional 5 minutes. 7. Allow the cookies to cool and put in a food processor. Process until you have a fairly fine powder. 8. Center a rack in the oven and preheat the oven to 350°F. 9. Melt the remaining 5 tablespoons of butter. In a large bowl, mix together 2 cups of the gingersnap crumbs, dark brown sugar, the remaining tablespoon of flour, and a pinch of salt. Add the melted butter and stir until mixture is moist and well combined. the crumbs should hold together when pinched with your fingers. If the crumbs do not hold together, add up to 1 tablespoon of cold water, a teaspoon at a time, and stir to combine. 10. Press the crumb mixture into a French flan ring, a pie pan, or a spring-form pan, evenly covering the bottom and sides. Place the shell on a sheet pan and bake until crust is fragrant and set, about 10 minutes. transfer the shell to a wire rack and let cool completely. With a fork or your fingers mix together the flour, brown sugar, rolled oats, and cold butter until crumbly. refrigerate until ready to use. 1. To make the caramel, pour the heavy cream into a microwave-safe measuring cup and heat until very hot. sprinkle 1/2 cup of the sugar evenly over the bottom of an 8- to 12-quart pot. Place over medium-high heat and cook until the sugar begins to melt and caramelize. stir it so it melts evenly and cook until it turns a deep mahogany color. When it darkens dramatically and starts to foam, add the hot heavy cream, little by little. Continue until all the cream has been added and the caramel stops bubbling. the caramelized sugar may clump; turn the heat to medium and cook until the sugar melts and you have a nice caramel sauce. Add the rum and butter, and cook just until the caramel is smooth. Pour the caramel into a heatproof pitcher or bowl and cool it for about 15 minutes. 2. In a large bowl, combine the pumpkin and remaining 1/2 cup sugar and hand whisk until smooth. Add the cinnamon, ginger, nutmeg, pinch of salt, vanilla extract, and eggs, and whisk until smooth. Mix in the caramel and pour into the shell. 3. Bake the pie for 10 minutes. scatter chunks of streusel over the top and continue baking for another 35 to 40 minutes, or until the filling is puffed and set. A thin knife inserted into the center of the pie will come out clean. 4. Transfer the pie to a rack and cool to room temperature. serve with freshly whipped cream, if desired.